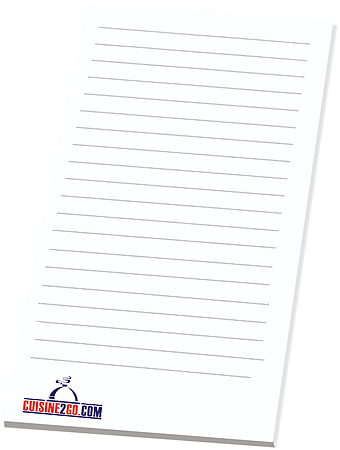 An economical choice for a promotional note pad. Useful size custom note pad for limited budgets. Promotional note pad features include 60 lb. white offset paper and sturdy chipboard backing. Note pads available with no charge flood coat printed for customized note pads. Overall size is 3" w x 6" h, 50 sheets to a pad. Bulk packed in carton. Price includes almost any number of print colors in area 2 5/8" w x 5 5/8" h.
No Factory Setup Charge for this four color process printed note pad. Logos require Illustrator, In Design, Photo Shop ai, eps or pdf.